The ‘Country Garden’ colour themed On t’ Shoot Luxury Dog Bed Set includes everything you’ll need to provide the lap of luxury for your pooches. Finished with hand drawn illustrations depicting traditional scenes inspired by the working dogs which accompany their masters on moorland shoots the complete set provides an authentic nod to a traditional country way of life whilst delivering levels of comfort and acres of space your dog longs to lounge in. 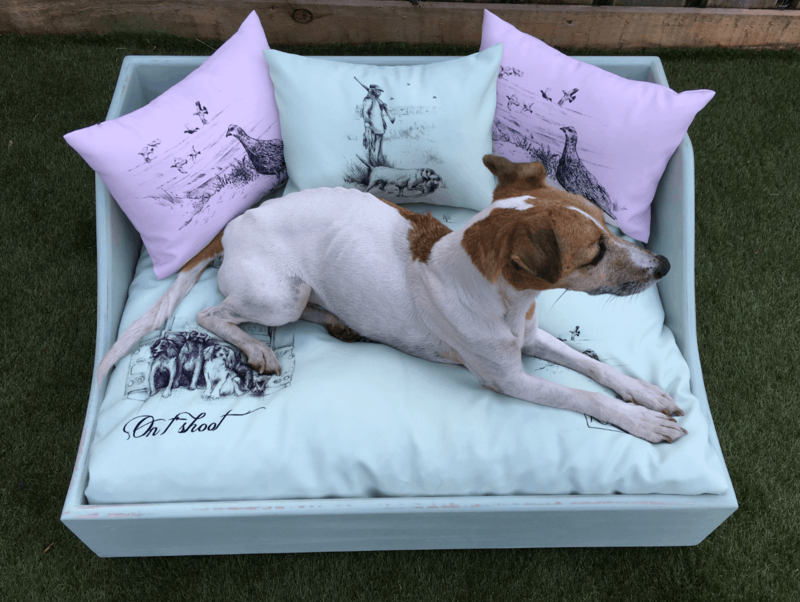 The wooden bed, lovingly hand crafted and painted in laurel green before being hand distressed and lacquered, is designed to perfectly house the matching size of cushion bed which benefits from the highest quality human grade hollow fibre filling to deliver the maximum comfort however big your four legged friend happens to be and finished with pale pink and green envelope scatter cushions. 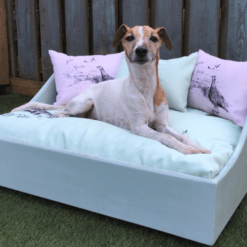 The Luxury Dog Bed range has been specifically designed to withstand the rigors of life with a working dog! Toy size not available in this range | Small bed sets come with 3 envelope cushions as shown in the picture | Medium bed sets come with 3 larger square scatter cushions in the same colour way as specified with various designs from the On t’ Moors range. 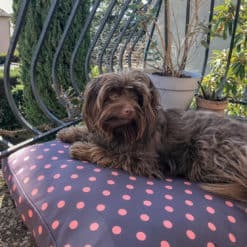 Personalise your cushion 10 characters remaining Type the name of your dog. Born from a frustration of always having to buy larger sizes than expected for my own dogs, the Miaboo product range delivers generous sizes deliberately designed to provide a true reflection of the space your dog craves too. Bed in images = Medium. 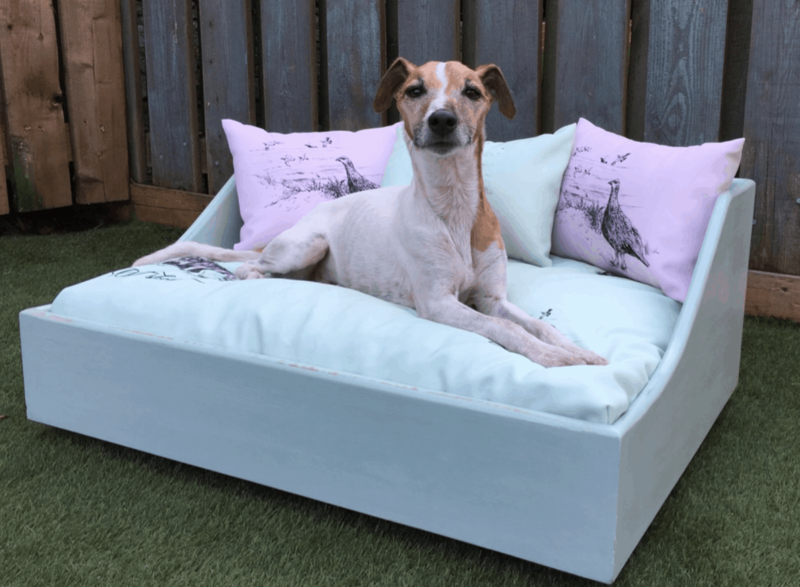 All of the fabric used throughout our luxury dog bed range is treated with an advanced D-Fender technology making it water repellent and stain resistant in order to help ensure it stays in great condition for longer. Accompanied with advanced Soil Release technology it also helps remove the dirt, which will inevitably build up from your dog’s usage, during washing. 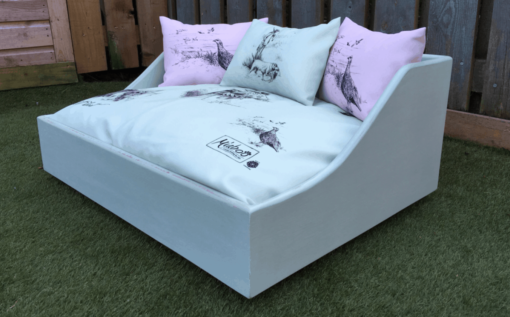 In preparation for washing the cushion bed material has been heat treated prior to production helping to stabilise the fibres and prevent the likelihood of shrinkage during washing. 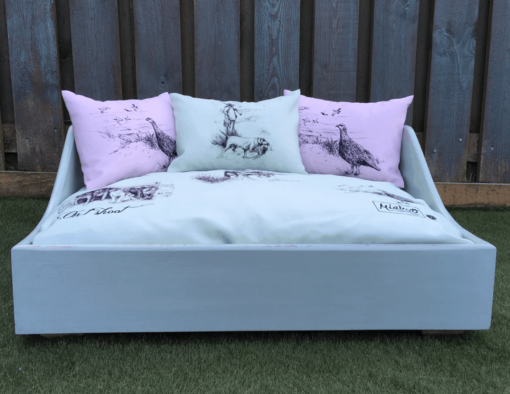 The printed illustrations and personalisation are also applied using a heat sealing process to help prevent fading during washing and throughout the cushion bed’s lifespan. Water repellant. Deep filled with premium grade hollow fibre filling. 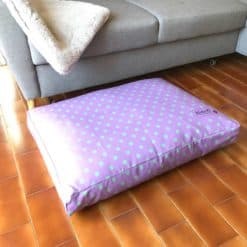 Handmade by Miaboo in England. Please note that due to the bespoke handmade nature of our products order processing takes a little time. 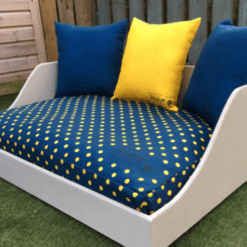 Typically Luxury Bed Sets and Wooden Beds take approximately 28 days for dispatch whilst our Cushion Beds, Scatter Cushions and various Mats take approximately 14 days for dispatch. We provide a 24hr period of grace for cancellation. Within this period we will issue a complete refund of all monies paid. In the unlikely event that you have received your ordered goods in a damaged or faulty condition please find our returns process below. 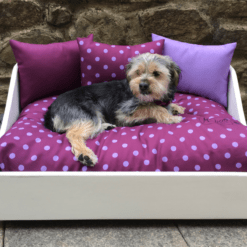 * Please note that in line with our terms and conditions, our products are custom made in a personalised fashion bespoke to your order specification. As such we are unable to offer returns, refunds or exchanges other than for faulty of damaged goods. If at any point we wish to provide you with refunds or exchanges it is entirely at our sole discretion. 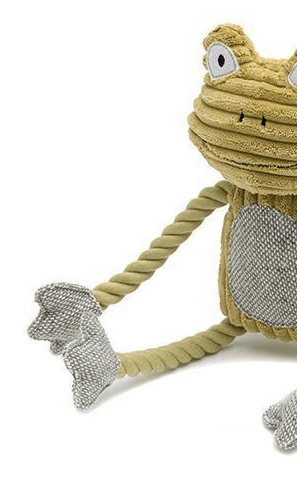 Miaboo will repair, exchange or refund faulty goods providing that any issues are not the result of reasonable wear and tear, inappropriate use of the product or deliberate damage. 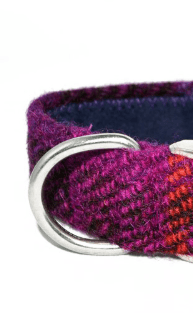 For example a broken zip or torn fabric would not be considered faulty if it has been chewed or torn by your dog.